Carrie Fisher lost 50 pounds in 9 months. Home Entertainment Carrie Fisher lost 50 pounds in 9 months. Carrie Fisher unveiled her new 8 size figure after losing 50 lb at 54 this morning at the NBC’s Today Show. 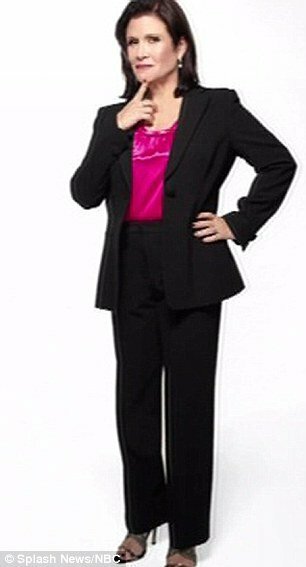 Carrie Fisher, the Star Wars actress, 54, has shown off her slimline new look after losing of 50 lbs during an appearance on the Today Show. The Star Wars actress said she lost 50 pounds in 9 months since becoming the face of diet company, Jenny Craig. Carrie Fisher lost 50 lb in nine months. [googlead tip=”patrat_mediu” aliniat=”stanga”] Carrie Fisher had joked about trying on her iconic gold metal bikini she wore as Princess Lea in Return of the Jedi in 1977. But she said women above the age of 50 should not ever go sleeveless. While Carrie didn’t say anything about her rejuvenated features, she was certainly forthcoming about her decision to lose weight. “I couldn’t look in the mirror. I saw pictures of myself where I didn’t look like myself. Now, Carrie Fisher, 54, is feeling more confident than ever, and is even ready to find love again. “I’m putting myself on the market,” she told America’s People during an interview in the latest magazine’s issue. Carrie Fisher relations include Blues Brothers co-star Dan Aykroyd, singer-songwriter Paul Simon and casting agent Bryan Lourd, with whom she has a 19-year-old daughter, Billie. At one moment in time, Carrie topped the scales at 180 lbs, she has said in the past. To achieve her actual body, she reduced her intake to 1,500 calories per day. Her favourite snacks include Skinny Cow Cookies ‘n Cream ice cream and Kozy Shack rice pudding. Carrie Fisher also embarked on a fitness regime, doing 40-45 minutes of cardio 5 times a week. “I’m not in love with the treadmill,” Carrie Fisher said. Ocracoke Island evacuations ahead of Hurricane Irene.